Everybody loves an adorable sock monkey doll! They’re soft and cuddly and that smile on their face is as warm and inviting as a smile can get. 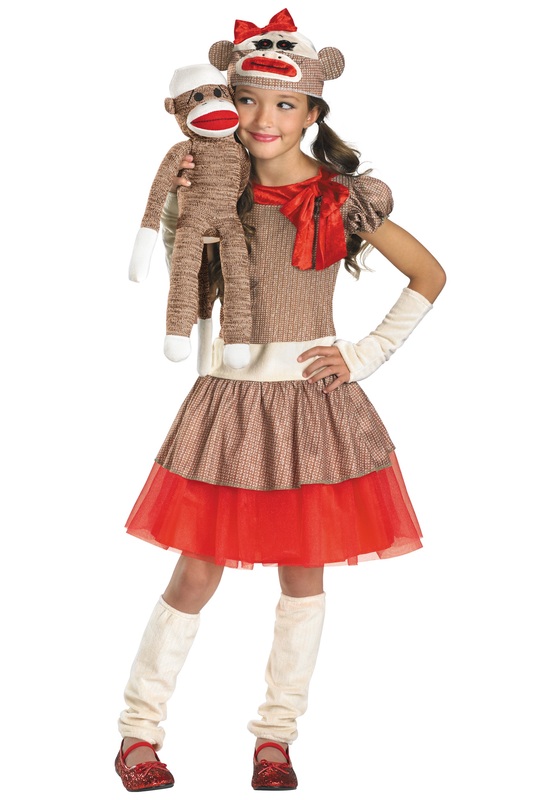 Wouldn’t it be amazing if there were a costume that matched the endearing and lovable essence of a sock monkey? We're asking that sarcastically, of course. Cast an eye on this awesome Sock Monkey Costume for girls. This delightful outfit will transform your little girl into a classic toy. After one look of your kiddo, while she’s rocking this retro look, adults will be brought back to the fondest memories of their childhood. Your little monkey will make other children wish they'd found a costume as cute and unique as this one. The costume comes with everything needed to complete this vintage look. A lovely dress along with the elbow length glovettes and leg warmers resemble the comforting color scheme of a classic sock monkey. The cute cap has the adorable face of a traditional sock monkey and, as an added bonus, a stylish red bow as well. Finally, to really bring the whole costume together, a monkey tail is even included! Once your kiddo throws this costume on, whether it be for the upcoming Halloween season or for an annual Sock Monkey Festival, she is sure to be a crowd favorite. She’s going to be so gosh darn cute it’s going to drive you bananas! However, you can’t let her get away with too much monkey business… dealing with animal control is never fun. The costume is cute and good priced! I ordered a child size large and was glad I did as the medium would not have fit (my daughter is 8 and in 8/10 clothes). So if you are debating what size I'd go with the larger one. The leggings are a little tight but will work. I was satisfied with the look of the costume and fit.